This also makes one of the few times we see Gandalf overtly use magic. Very little of the magic we see in Middle Earth is overt, rather it tends to be an aspect of innate or imbued nature. The elves by and large are not 'magical' but rather in Middle Earth creatures of Good and Light bear that as a force in itself. Most of the veneration goes to their wisdom and its applications. It's only a few individuals that stand out as workers of the arcane, and often that results in fears and rumors. The meeting between Denethor and Faramir is gut churning, tainted with Denethor's anguish, suspicion, and anger. I can't help but see the source of Boromir's character flaws in Denethor's attitude and mannerisms. Thank the powers that be that the Ring never came near Denethor, I don't think he would have held out nearly as well as Boromir against it's influence. I also cannot help but see a reflection of anti-intellectualism movements in Denethor's disgust at Faramir's manner, "your desire to apear lordly and generous as a king of old, gracious, gentle." As if Faramir's desire to be a good person is a character flaw. Part of me wants to credit Denethor's near rejection of Faramir as a symptom of grief, but that he sends his remaining son to expected death makes it hard for me to give that credit and instead reflect on what must be broken beyond grief inside this man. What ever was previously broken broke further when Faramir came back mortally wounded. The only light in this chapter is the help come in the eleventh hour, the arrival of the Rohirrim. For various reasons, and quite possibly to the benefit of the film, much of this chapter has been trimmed down. Largely trivial details are worked in casually elsewhere (such as the arming of Pippin), while the emotional moments such as Gandalf telling Faramir "Your father loves you, Faramir, and will remember it ere the end" resound strongly. Similarly rearranging when Pippin is asked about singing to after Faramir goes on a suicide mission and adding his singing over a mix of images of Faramir riding to battle and Denethor eating is beautifully done. 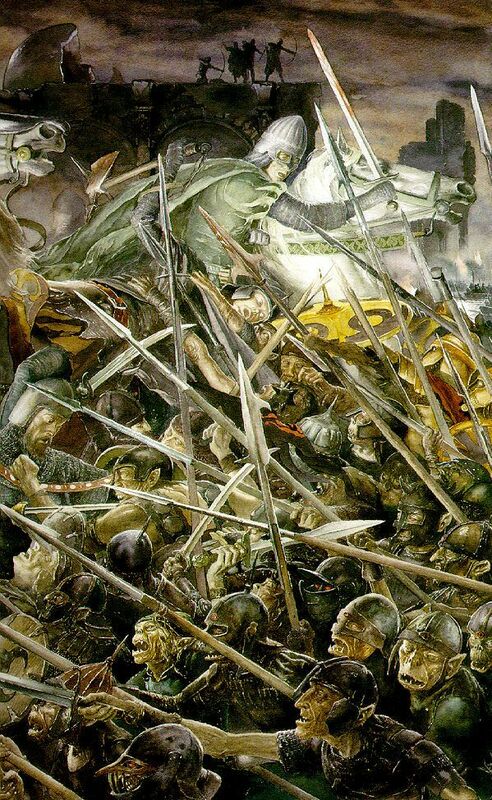 On a larger view, these scenes are intercut with the mustering of Rohan as the chapters are in the book, albeit with slightly different ordering. Jackson has a far different type of narrative momentum going at this point. In some ways I prefer the grief-filled madness of Denethor that Jackson portrays, no matter how horrible and misguided it manifests, with the exception of it turning into a comedic moment with Gandalf beating him down with his staff (also, a staff to the face like that would cause a bloody nose at least). I'm sold on the emotions he presents on the screen. Seeing the funerary preperations however makes me wonder that no one registers Faramir's continued life except Pippin. Even with nigh undetectable breath, dead bodies do not fever or sweat. Comedy may ultimately be necessary to keep the audience engaged for a film (trilogy) on the scale as this, but much of its excecution serves to shift much away from the darkness of the narrative into heroics and adventure. Rereading this what stands out so much to me is how dark and hopeless things are for all of the involved parties. I want to feel the hope and relief, worry that reinforcements will not arrive in time, not giggle or chortle when the heroes step in. Much of this comes I'm guessing is part of a 'family-friendly' approach, and dramatic violence kept clean often teeters into slapstick. However the visuals, my complaint about narrative interpretation aside, are done beautifully.